Love it or hate it, you have to admit that New York City is home to some of the world’s most impressive and diverse architecture. Pick a style from the last 200 years, and you’re bound to find a fantastic example somewhere in Gotham. Now, you can find them all on one reasonably priced poster. “Splendid Structures of New York City” is exactly what it sounds like: a catalogue of the Big Apple’s best buildings. From the stunning TWA Flight Center at JFK to the art deco Brooklyn Museum to the impossibly tall and skinny (and expensive) 432 Park Avenue in Manhattan, each of these buildings shows off a uniquely New York state of being. And the blueprint-style renderings make it easy to separate the form from the function. You can buy a signed and number print from Pop Chart Lab for just $30/£21. 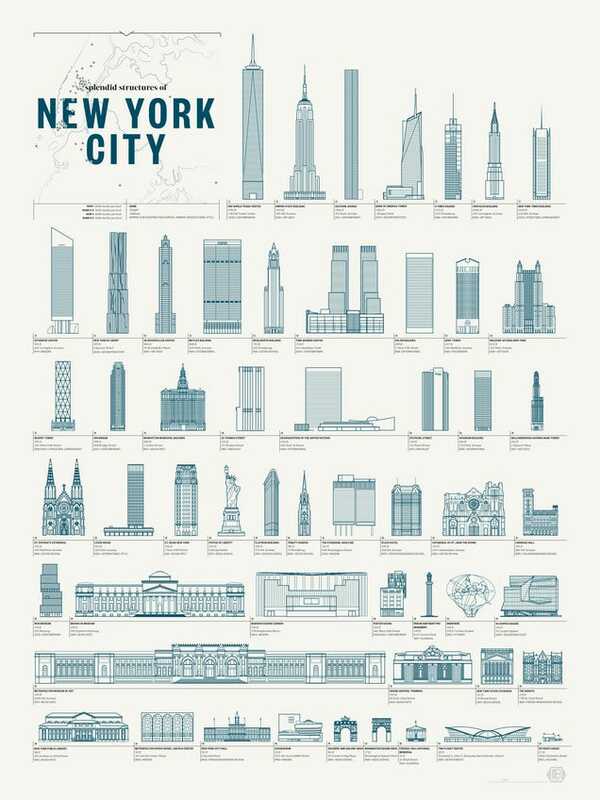 While you’re at it, you might also want the poster’s sibling prints “The Schematic of Structures”—which is basically a poster of man’s greatest erections—and “The Wonderous Water Towers of New York City”—you can guess what that one’s about.